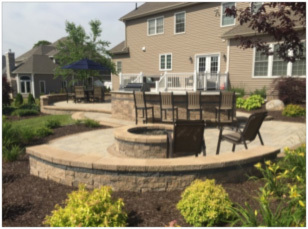 "After speaking to four or five companies we decided to use Clarke Landscapes for our outdoor project, and I can tell you upon completion we made 100% the right decision. We had a basic idea of what we wanted, but it was really Mather's creativity, expertise and vision that is why our project has surpassed our expectations. From day one, the guys working at our house were professional, courteous and went above and beyond with any needs/concerns we had without thinking twice. Dave, Mather's right hand man, was also integral to the project and also had tremendous vision. During the whole project, which lasted over 10 weeks, we were well informed and the passion and creativity remained. Mather and Dave would sometimes talk about ideas for hours. It was amazing to see the transformation of stone, dirt and machinery into what we have now. Our friends and family continue to marvel at the attention to detail and subtle accents that really make all the difference. If you have an outdoor project and want it done right I cannot recommend these guys highly enough. 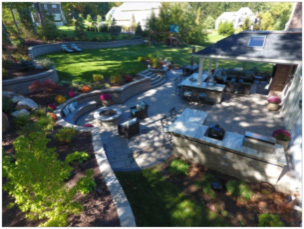 There are companies that will simply "install" what you tell them, and then there are companies like Clarke Landscapes that think, create, and execute what are true living spaces and extensions of the home that will be utilized for years." Huge thanks to Mather Clarke and the entire Clarke Landscapes Team. Not only is our new outdoor living space amazing, but it was done in time for my husband's surprise party! Thank you so much for your quality workmanship. Stop by for a drink - I see many nights by the fire pit in our future. Enclosed is final payment for our beautiful patio. Thank you so much! We love it. Your crew was awesome-professional, knowledgeable and courteous! I would be very happy to serve as a reference. "My wife Carol and I would like to thank you for the splendid job of designing and building our beautiful new stone wall. We have received many compliments from our neighbors. We look forward to enjoying the wall during the upcoming years. We especially appreciate the quality of the materials used and the workmanship. Your crew was very efficient, conscientious about doing a good job, and very courteous. It was a pleasure having them work on our property. Well done!!!!" "We didn't want to let too much time pass before writing to you. We are so pleased with the patio and have already used it many times in the past few weeks. We always had a nice retreat in the woods - but now we are actually USING the space to read, cook and relax. Your team was a pleasure to work with on the project. Dave kept everything moving and we felt very well informed throughout the build. He went above and beyond to make sure that our property was well cared for and that the patio ultimately fit our vision. Jimmy was the other key component to the team. He is an extremely hard worker that was very dedicated to the project and easily served as our onsite contact when Dave was unavailable. We cannot compliment either of them enough! From the beginning, we have loved your vision for this project and we hope to work with you again in the future. Thank you for creating our new backyard oasis! It's perfect." Quality workmanship throughout with excellent attention to detail and the customer's needs makes Clarke Landscapes a terrific choice. We had them install our pool deck and patio pavers and the job was beautifully done. 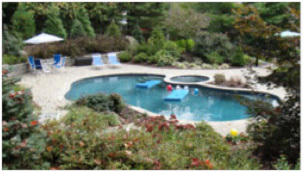 Even after we needed to have work done on the pool which required some of the pavers to be removed, Clarke Landscaping returned to reinstall the pavers and "fine-tuned" it to insure we were pleased!! Special thanks to Mather and Dave! "Thank you again for the beautiful job done by you and your crew. 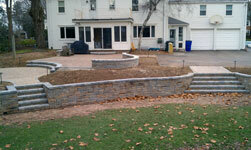 I look forward to seeing the completed project once the landscaping is done in the spring!" I have been so impressed and amazed by how gorgeous all the colors are of everything you chose for the back yard. It is just beautiful. I would highly recommend you to anyone. We want to thank you for the wonderful job that you and your team did on our poolscape/patio project. You had the vision to turn a cleared lot into a backyard oasis. Thank you for your patience from the initial design phase through the completion of phase 2. 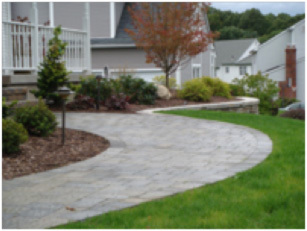 What truly sets you apart from the other landscapers is your ability to provide exceptional design ideas while listening to our likes and dislikes. (Yes, I know I had many!) We appreciate your patience! The quality of your work is outstanding and we welcome any potential clients to visit and talk with us! It was a pleasure working with you again! Glad to hear everything is going so well. I really appreciate all the hard work your crew did especially in that heat. They did a fantastic job. People are still stopping by and asking about the work. They cannot believe the transformation. The walls you designed and the way that it all flows together is just amazing. The new walkway is now a lot more accessible and easier to use- not to mention a lot prettier. I’m glad you recommended the colors you did because they blend so nicely. You truly have an eye for it! Please use me as a reference any time. We are very happy with your work and professionalism. You and your crew have been excellent during the entire project from start to finish. 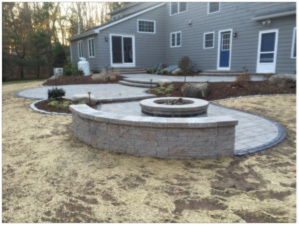 We cannot tell you how impressed we were by your ideas and how seamlessly you incorporated the new landscape into our yard. Everyone at the party was impressed as well. Thank you for meeting our deadline. Talk to you next year for phase two! Thank you for such a wonderful job on the walkway. We love it! I’ll call you in the spring so we can plan the rest of the landscaping. Have a safe and healthy winter. Mather, I just wanted to let you know that we are so happy with the work you and your crew did. 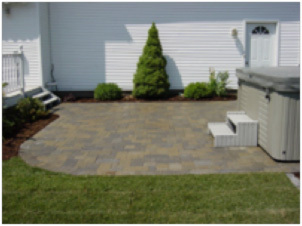 Your design was by far the most comprehensive and makes the back yard look fantastic! What a transformation! It meant a lot to us that you went above and beyond our expectations for this project. I know I will get a lot of enjoyment from the new patio. Thanks so much for the great work! I can’t wait to see everything in full bloom. We will be in touch sometime in the spring to talk about the back yard. Enclosed is the final payment for our landscaping job. We are very pleased with the outcome. It is such a pleasure to see the results and we will of course enjoy this for a long time to come. Many neighbors have commented on how attractive the walkway, retaining wall and lighting look. 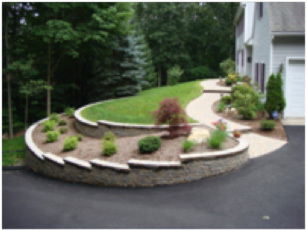 We will certainly pass your name along to anyone who may be interested in a landscaping facelift. I will be calling you in the spring for a landscaping “tune up” after the winter months. Thanks again for a very professional job. I just wanted to thank Mather and his crew for doing such a wonderful job, first with a lovely designed walkway, small patio in our backyard and boulder retaining wall near the garage. We received so many nice complements from our neighbors to complete strangers asking us who did the work for us. They too were impressed with the style and quality. The following year we had Mather return and do another boulder retaining wall near our pool and drainage too. We would recommend Mather to everyone, for his style, workmanship, and quality. Our home was undergoing major remodeling and decided that the exterior needed to be addressed as well. We contacted Mather Clarke to give us ideas for walkways, a patio and overall plantings and landscaping. Mather developed a design that was truly beautiful and exceptionally functional. As with any project, questions and concerns may arise. Mather impressed us with always responding in a timely manner. His work ethic is one to be admired. We thank Mather tremendously for giving our home a "wow factor" that continues to receive many compliments from family and friends. We were in search of someone to change the “look” of our home. We went to various Home Shows and had three landscape companies come out to look at the various projects that we wanted done. You'll find dealing with contractors can be stressful. However, once we chose Clarke Landscapes to do the work, we knew we made the right choice. While working with Mather, you get what you pay for- and more. He took the time to listen to concerns and address our needs while working within our budget. The work done on our property was quite a transformation. 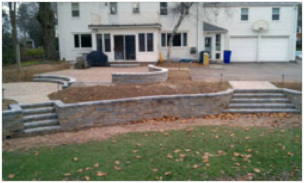 A front hill turned into a retaining wall with a planted area, the old stone wall on the side of the driveway replaced, a new front patio area with sitting wall and lamp post along with a new front walkway with granite steps and granite landing. That was just the front of the house! 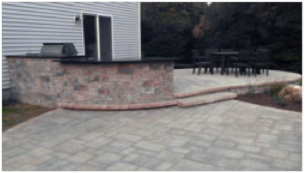 They also removed the old flag stone patio in the back, created a new much larger patio area with sitting walls, built in grill with smooth finish granite counter tops and edged the garden areas with granite cobblestone so that everything would blend in. Quite an undertaking!! We were impressed with the way they did the job. Within each area they worked on there were a number of challenges that need to be addressed due to drainage, grading, etc. However, all that was taken into consideration when planning the job. In speaking with Mather, we found that he has a Construction Management degree and his expertise certainly paid off in completing our project. Not only did he address all the challenges, but his crew transplanted a number of trees, shrubs and plants we wanted to save and incorporated them into the design. 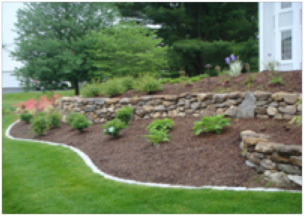 They also added just the right touches of perennials to finish the look and we can’t forget Mather’s trademark the “boulders.” All throughout the construction they took care in making sure that all materials were kept as neat and orderly as possible. If you are interested in changing the “look” of your home, no matter how big or small of a job, we would strongly recommend you contact Clarke Landscapes! The patio looks great. I am very pleased with the outcome. We moved our patio furniture and hot tub onto the patio and everything fits fine! Thank you for a prompt and tidy job. I will keep you in mind when we decide on other changes to the property. Mather, I just wanted to thank you for the awesome job! I was so impressed with the designs you proposed and the one we eventually went with. Thanks for working with me on that. Over the years, I have always been amazed by how you are able to come up with great solutions to any problem. I’m glad you were able to stick within my budget- although I would have liked to have done more! Your crew was great to work with as usual and was courteous and clean on the job site- a rarity these days. You are a breath of fresh air compared to other contractors I have worked with. Keep up the good work! Good luck in the future and I look forward to working with you again. Thanks. 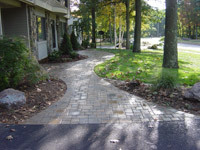 We recently hired Clarke Landscapes for a complete re-design of our front lawn, driveway and walkways. I truly can say that the quality of work performed, cleanliness of workmanship and exceptional customer service provided by the team throughout the entire project exceeded my expectations and gave me complete peace of mind. Mather Clarke was extremely conscientious of scheduling and completing our project and truly went above and beyond our expectations. He has a keen eye to creativity and design which allowed him to provide an array of architectural and landscaping designs to our project. He was sensitive and appreciated our style, budget and level of comfort with the end result. 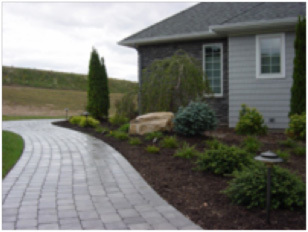 I highly recommend Clarke Landscapes to beautify your home!! They did ours!! We wanted to take the time to thank you for designing and creating such an amazing landscape for our new house. We loved our house to begin with but once you added the landscape you made our house into a beautiful home. You created an amazing environment from the plantings and specimen trees, to the paver walkway with all of its beautiful curves, to the amazing added texture of the boulders, all the way to the lighting. Every thing you and your crew set out to do was accomplished with such precision and care. With your expertise you were able to pick out the best plantings that suited the size of our home so we wouldn’t have to wait for our landscaping to mature. The landscaping looks like it has always been here. You and your crew worked quickly and professionally. We give tours of our landscaping, just as we do the interior of our new home. We give you the highest of recommendations and wish you well. We look forward to working with you again on our next landscaping project. Having recently been married, we have spent the last year and a half attempting to get our home and yard organized. Needless to say, we have not had the best experiences with contractors. Mather and the crew from Clarke Landscapes, LLC. were timely in their responses to our inquiries, completed our patio when they said they would, and cleaned up after themselves! Mather has a good eye for landscaping, and the creativity that he brought to our project was not only within our budget, but definitely added that “WOW” factor to our patio. Our patio was completed last fall; unfortunately we have yet to use it. But that does not stop all of our friends and family members from commenting on what a “great job they did!” The warm weather cannot arrive soon enough! Please call us if you want to come by to take pictures. We have been enjoying the back yard and continue to get lots of compliments on your work. Thank you for fitting us in so quickly. We will continue to refer family and friends.